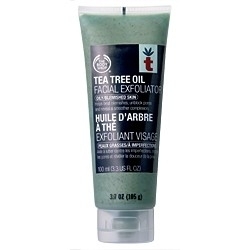 Creamy facial scrub that gently exfoliates and removes excess oils, helping to control blemishes to leave the skin smooth. Made with ground tea tree leaves, beeswax, and pro-vitamin B5 deep cleanse and condition for clearer, softer skin. Glycerin (Humectant), Aqua (Water) (Solvent/Diluent), Cera Alba (Beeswax) (Emulsifier/Emollient), Cetearyl Alcohol (Emulsifier), Cocamidopropyl Betaine (Surfactant), Disodium Lauryl Sulfosuccinate (Surfactant), Sodium Cocoyl Isethionate (Surfactant), Zea mays (Corn Starch) (Absorbent/Chelating Agent), Melaleuca alternifolia (Tea Tree Powder) (Natural Additive), Sodium Laureth Sulfate (Surfactant), Cocamide DEA (Surfactant), Silica (Absorbent), Hydrogenated Castor Oil (Emollient), Phenoxyethanol (Preservative), Panthenol (Skin/Hair Conditioning Agent), Methylparaben (Preservative), Disodium EDTA (Chelating Agent), Butylparaben (Preservative), Ethylparaben (Preservative), Methyldibromo Glutaronitrile (Preservative), Isobutylparaben (Preservative), Propylparaben (Preservative), CI 77289 (Colour), CI 77891 (Colour), CI 19140 (Colour), CI 47005 (Colour), CI 42090 (Colour). Tea tree does not smell to great but it's properties are just amazing. This product cleared my face up and any soreness was gone no problem.